That’s a great opening line… but it was nice. It didn’t start off that way though. I woke up around 5am and just messed around on the internet for a while until mom woke up. We went for breakfast, which was good, then she went for a run in the hail and sleet and came back. All good so far. Then we decided to go to the “wellness area” which is a hot tub, sauna and steam room (and a rack of weights…) and is 10 euro extra. We’re expecting nice things. We’re the only ones there, but it’s 8am, so not a surprise. We get in to the hot pool and I notice “floaties” I comment to mom and she says to just ignore them. But they’re huge and tickly and touching me. It’s gross. And then I realize… IT’S SKIN! FRIGGING HUMAN SKIN. Someone has peeled their feet or something and the filtration system isn’t working and there is large floating masses of human skin in the hot pool. I can’t get over it and I really don’t want to be sitting in SKIN SOUP so we go to the steam room. It’s not great, so we go to the sauna. It was much nicer, but I’m so used to Cedar saunas that I missed the smell. Mom spoke to the hotel receptionist after we got back about the fact we were sitting in Skin Soup, expecting a refund or at least horror, but just got a “oh sorry.” So that was a thing. Skin Soup was a thing. We headed out after that and set out for a nice day of galleries and museums. We went to the Reykjavik Art Museum at Hafnarhaus, the photography museum, the Einar Jonsson museum and the National Museum. The Art Gallery was all modern art, so it had boxes that you climbed up on and had to stick your head inside to see icebergs on the ceiling and chairs with screaming people painted on them and the normal fun stuff. The Photography museum is free and connected to the library. It’s really nice. Apparently there was an exhibit in 2007 on colourful houses that I really wish I’d seen. The Einar Jonsson museum was a surprise. We’d just been to the Heimskringla church which was very nice and very Lutheran and we were trying to walk to the National Museum. In behind the church is the Einar Jonsson museum. We just happened to see the entrance to the courtyard, which was under construction and went for a peek. I expected a church graveyard, instead there was all this amazing sculpture. We didn’t realize there was even a museum to go inside, we just stayed in the courtyard. My favourite pieces were “Earth” and “Memorial to a Lost Airliner”. Earth is a woman, dead or sleeping in the larger arms of a figure who kisses her head and holds her tightly. The figure is bald and relatively androgynous and is only a with it’s long arms held out forwards to hold the woman. Memorial to a Lost Airliner looks at first to be about a ship, but the closer you look, you begin to see all the details of the plane and you wonder how you could ever miss them. The only thing that detracts from it (in a pretty huge way) is that from the front, a segment of the piece looks like a pair of testicles tea-bagging the face of a figure… It’s hard to see from the pictures online and I didn’t take a picture. But the piece is so beautiful and amazing and then… balls. We walked over to the National Museum in a HUGELY convoluted way that ended up with us at the University of Iceland after we crossed a highway via bridge. Leave one University for a week and end up at another!!! The National Museum was quite nice and had a few dress up and interact areas which I always like. 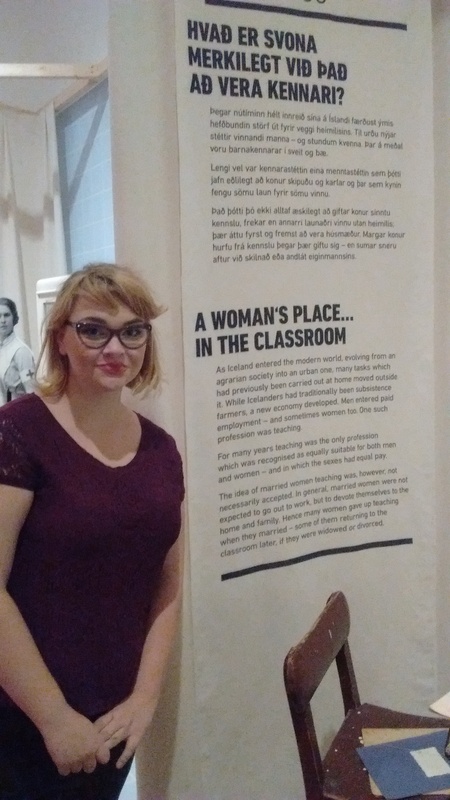 The exhibit on women in Iceland was really well designed and fun and eye catching. It was neat to see all the historical objects in the history of Iceland exhibit that I’d seen while researching my paper or in class during Scandinavian Mythology last year. Mom and I noticed however, that there was no mention of the large exodus of Icelanders in the late 1800s early 1900s when our ancestors came over, or of the Danish suppression of Iceland. It also spends very little time on the earliest times of Iceland before Christianity, but LOTS AND LOTS of time on all of the artifacts and churches and everything Christian. Obviously this is because there are far more surviving artifacts of Iceland’s Christian history and they’re in great shape, but I was more interested in pre-Christian Iceland. There was also a group of small children on a class trip and I pretty much wanted to take every one of the adorable blonde and ginger moppets home. And then I remembered I’m going to be a primary teacher and I’ll get to spend my days with little kids all the time! We also went to Te og Kaffi again, where the cappuccinos are the bestest. We went to a store called Tiger where I bought everything: Calligraphy pens, fuzzy hot pink glasses, a wooden washi tape dispenser and tangram dinosaur wall stickers. We went to a hardware store and a hipster store and a kitchen store and a grocery store. I haven’t seen juice packaged like Soviet Propaganda before!! And then we came back to the hotel and I want to sleep forever. Then we went on a Northern Lights Excursion and didn’t see any Northern Lights. But we went to Fontana spa and sat in the hot pools and there was no skin and it was very nice. Except for the American man who wouldn’t shut up on the bus and kept asking the tour guide inappropriate and rude questions. Everyone moved to the back on the way back from Fontana. In the picture at the very top of the page is the picture we took Tuesday night when we went to visit with our Icelandic cousins (and eat delicious cheese). It looks like I inherited the shared cheekbones more than mom did! This entry was posted in Iceland and tagged Cake Company, Einar Jonsson, Fontana, Groceries, Hafnarhaus, hannah, Iceland, Museums, National Museum of Iceland, Photography Museum, Reykjavik, Tiger Iceland, Vikings. Bookmark the permalink.